The CORNET ED85EXS is a new version (forth generation) of the the old ED85. It is a single axis RF meter for frequencies between 1 MHZ to 8 GHz (capable to sense RF up to 10GHz) . It has a digital LCD display with a lot of information and in addition a color bar led display. 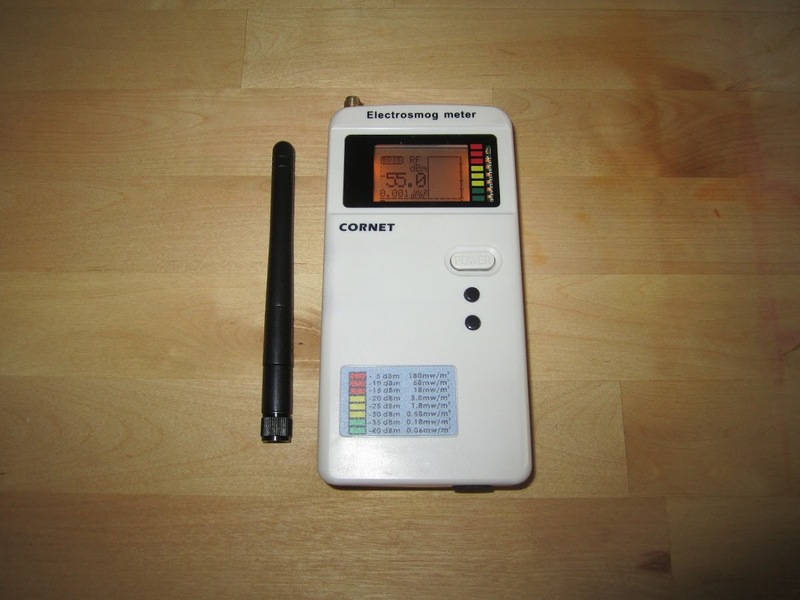 The CORNET ED85EXS can measure from 0.1827 uW/m2(-65 dBm) up to more than 1000 mW/m2. The meter is extremely sensitive and very fast. It is very easy to use. It can display the measured levels in dBm or mW/m2 or V/m. It displays the max level measured since power up. On the right side of the LCD the CORNET ED85EXS displays the last 30 measurements values into a histogram shape (couple of measurement are done every second). In addition there is a led color bar next to the right side of the LCD. The histogram gives the operator a very good indication of the EMR levels over the last few seconds and makes the job of finding EMR sources much easier. The CORNET ED85EX is equipped with a back light for the LCD display which is automatically turned off after 15 seconds. The Back light can be turned ON again by pressing the HOLD button, then the upper function buttons and then releasing the HOLD button. The LCD back light makes it possible to use the CORNET ED85EXS at night and in poor light conditions. The lower button is used to freeze (HOLD) the display on the last measured value (Hold function). A big On-Off button is located under the LCD and above the 2 function buttons in the front of the CORNET ED85EXS (gets pressed very easily when the meter is in the bag or not in use). The CORNET ED85EXS has an external antenna (you need to screw it on before use). It is possible to connect other types of antennas, filters, attenuator or to weirdly connect the antenna to a SMA RF cable and then to the meter it self. Please note the original antenna is not effective under 700MHz. 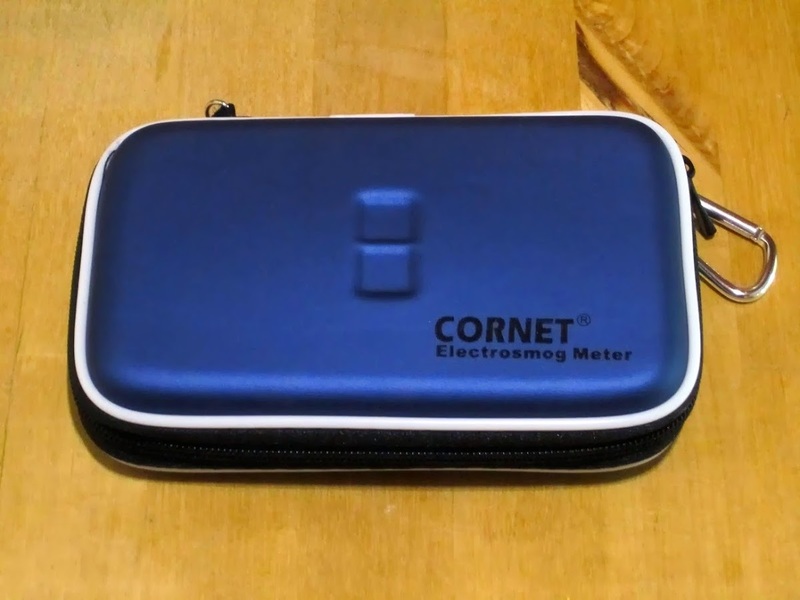 The CORNET ED85ESX uses a 9V battery (easy access from the back of the CORNET ED85EXS). During my testing the battery kept the meter working for more than one hour with the back light on. I recommend having a spare battery or even several rechargeable batteries if you use the CORNET ED85EXS more than once in a while. It is possible to connect external attenuation and filters (professional use). RF mode from 1MHz up to 8GHz (usable up to 10GHz, original antenna effective only from 700MHz). Changes units from mW/m2 to uW/m2 which might confuse the user. Original antenna effective only from 700MHz and up. Short battery life, better have rechargeable batteries. At first some people can find it hard to follow all the info on the LCD. You will need to take the antenna apart for safe keeping and storage. 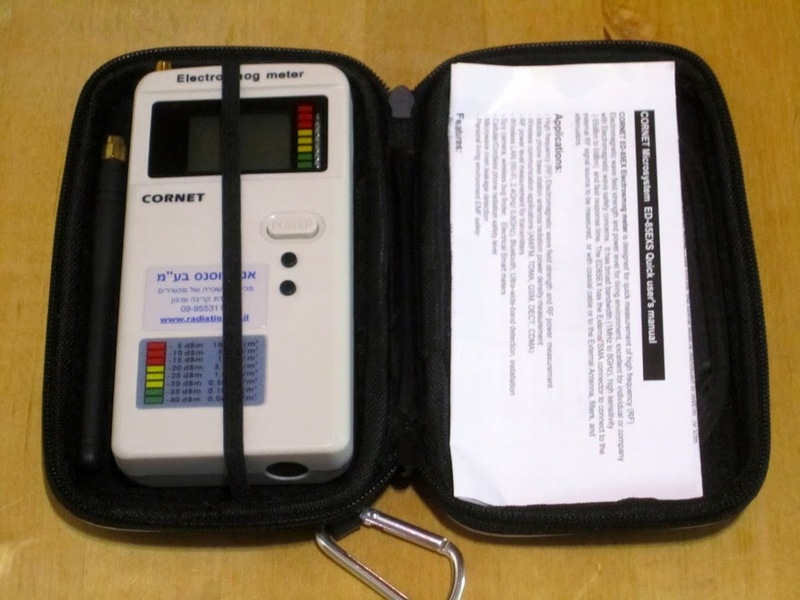 The CORNET ED85EX will suit you if you are looking for a RF meter for up to 8 GHz , and if you are not afraid from a lot of data being presented on the same small LCD at the same time. In addition, it will allow you to use external antennas, attenuator, filters and to connect the antenna remotely via the SMA connector (using SMA RF cable) if you are a professional user.